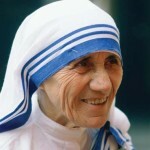 Mother Teresa died on September 5, 1997. Upon her passing her statue was placed in the center of the Pacifist Memorial on the grounds of the Peace Abbey in front of the 9 foot bronze statue of Mahatma Gandhi where mourners placed flowers and left prayers of thanks. 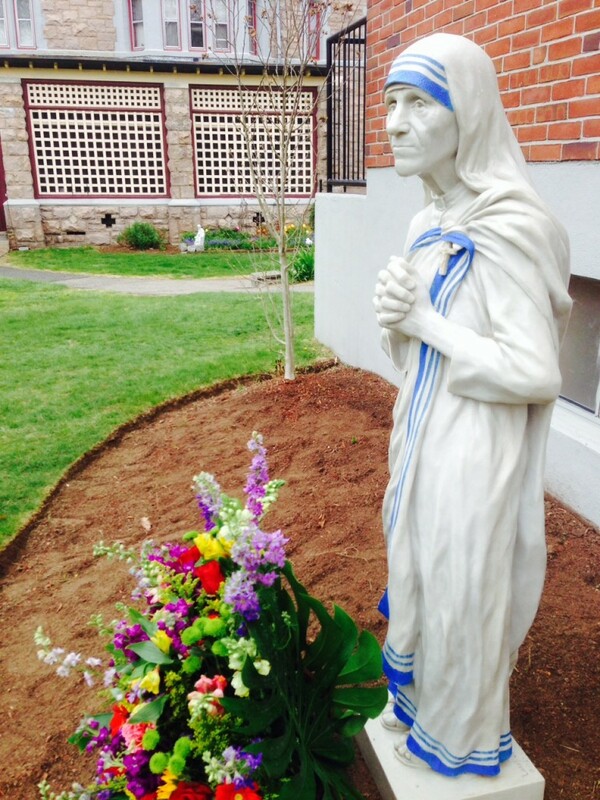 Mother Teresa statue at St. Mary’s Church in Dedham, MA. 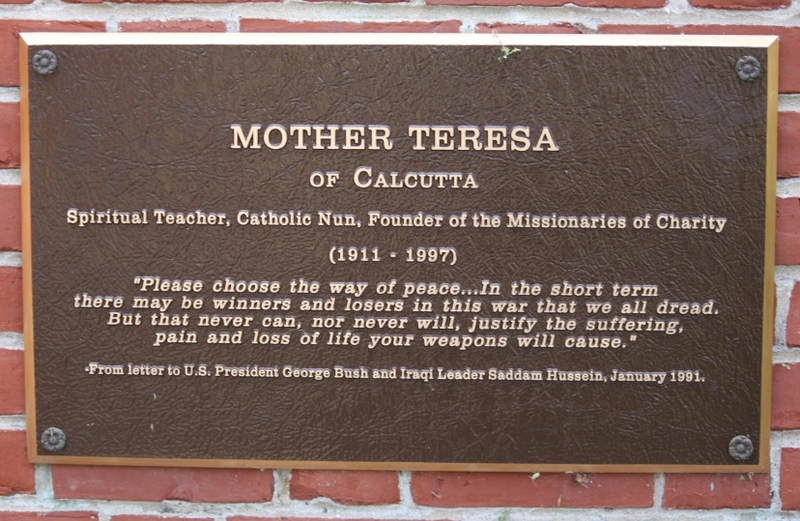 Mother Teresa with Peace Abbey Courage of Conscience Award in Calcutta Mother House. MOTHER TERESA VISITS LIFE EXPERIENCE SCHOOL IN 1988. On June 8, 1988, Mother Teresa visited the Life Experience School in Sherborn, MA. Having heard about the peace work of the organization from the school’s founder, Lewis Randa during his visit with her in Calcutta, India the previous year, she fulfilled a promise she made to visit the school. That she did and the Peace Abbey was established a year later. 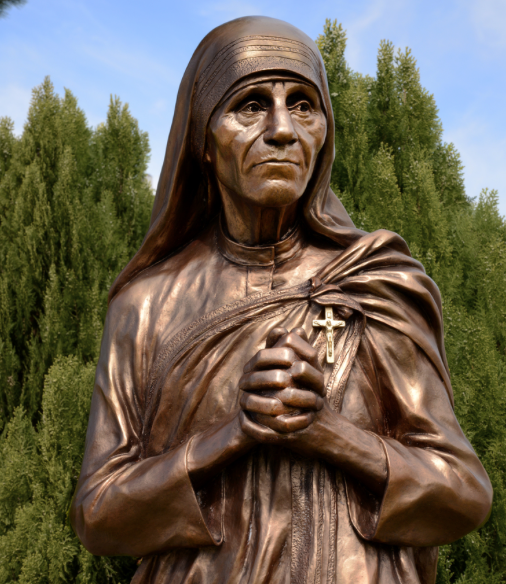 Mother Teresa was born Agnes Gonxha Bojaxhiu in Skopje, Macedonia, on August 27, 1910. Her family was of Albanian descent. At the age of twelve, she felt strongly the call of God. She knew she had to be a missionary to spread the love of Christ. At the age of eighteen she left her parental home in Skopje and joined the Sisters of Loreto, an Irish community of nuns with missions in India. After a few months’ training in Dublin, she was sent to India, where on May 24, 1931, she took her initial vows as a nun. 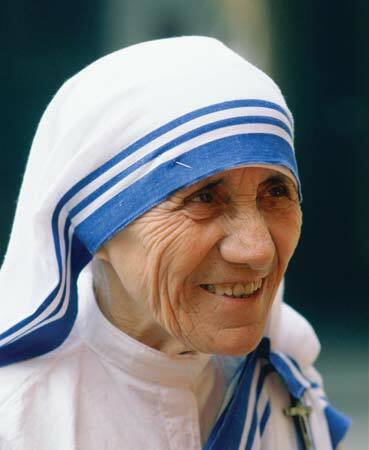 From 1931 to 1948 Mother Teresa taught at St. Mary’s High School in Calcutta, but the suffering and poverty she glimpsed outside the convent walls made such a deep impression on her that in 1948 she received permission from her superiors to leave the convent school and devote herself to working among the poorest of the poor in the slums of Calcutta. Although she had no funds, she depended on Divine Providence and started an open-air school for slum children. Soon she was joined by voluntary helpers, and financial support was also forthcoming. This made it possible for her to extend the scope of her work. 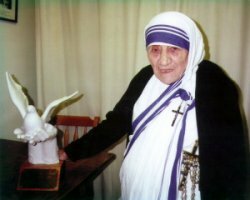 Mother Teresa’s work has been recognized and acclaimed throughout the world and she has received a number of awards and distinctions, including the Pope John XXIII Peace Prize (1971) and the Nehru Prize for her promotion of international peace and understanding (1972). She also received the Balzan Prize (1979), the Templeton and Magsaysay awards, and the Peace Abbey’s Courage of Conscience Award. 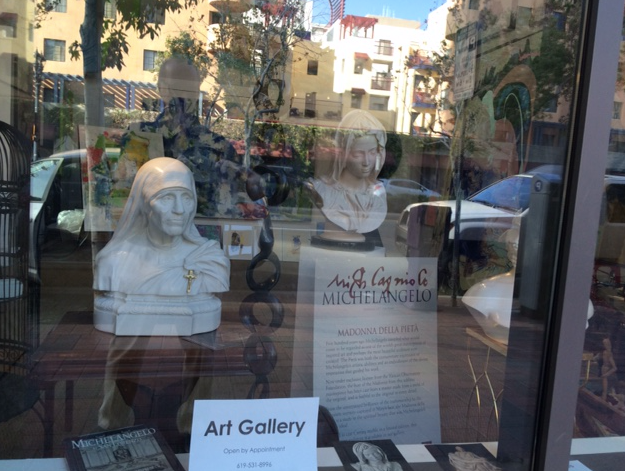 Statues are available by contacting the Peace Abbey Foundation.